he story about the Amazons was one of the most popular themes for Greek artists. There is a great number of pictures depicting Amazons. Most of the Amazon pictures are scenes of fighting. Amazons were considered as very brave, daring and fearless combatants, therefore only the most famous Greek heroes as Heracles, Achilleus and Theseus were capable to defeat them. Very popular were scenes of the heroic fight between Heracles and Hippolyte - Queen of the Amazons, and the life-and-death struggle between Achilleus and Penthesilea at Troy. 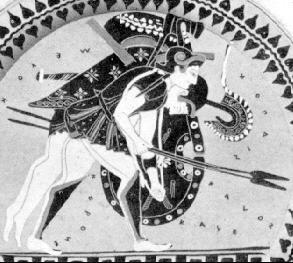 But Amazons were also desirable, so Antiope - Queen of the Amazons - was abducted by the Athenian hero Theseus. Besides being courageous and bold, they were also looked upon as warriors with dignity. Amazons are never shown as cruel, perfidious or cowardly. There are scenes of Amazons bringing in their injured comrades, risking their own life for helping others. 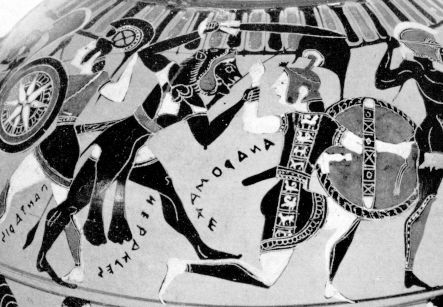 This vase-painting shows the fight of the Greek hero Heracles against the Amazon queen Andromache. An Amazon is carrying an injured one from the battlefield. This picture probably shows the famous town of the Amazons - Themiskyra. 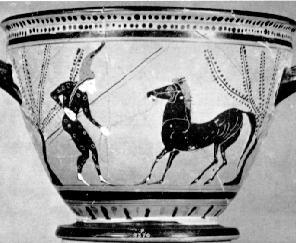 This vase-painting shows an Amazon training a horse. The Amazons were considered as skilled horsewomen. This scene depicts an Amazon saying her prayers in front of an altar. 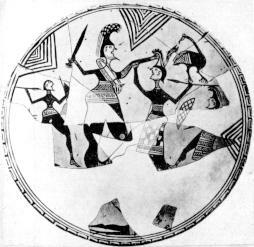 This picture shows the earliest, largely accepted representation of Amazons. It dates back to 700 BC. 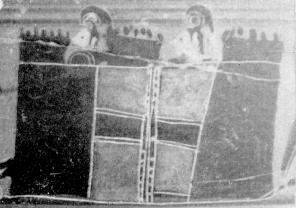 The two figures on the right side are interpreted as Amazons, at least they are female warriors because little circles on the chest indicate their breasts. 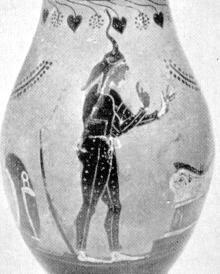 They are armed with spear and shield and they wear a long patterned gown and a very broad girdle. Most probably it depicts the fight between Heracles and the Amazon Queen Hippolyte.